Yeah, we're back to Parish Brewing out of Broussard, LA, but that's because they keep putting out good local(ish) beer that's worthy of a mention here on Feature Beer Friday! When you put out good beer that I can find easily enough in the Baton Rouge market (I picked up the Rêve Coffee Stout at Robert Fresh Market) then you're more likely to find a home in this corner of cyberspace. I think by now, you all know all about Parish Brewing, so I'll jump right into the beer itself, which Parish describes as, "This silky smooth coffee stout is created with a carefully selected blend of specialty grade estate beans from Columbia and Java. Our friends and coffee gods at Rêve have finished them to a city/full city roast to highlight the true character of the beans and their origin prior to addition to our export strength milk stout. Enjoy any time of day, this beer will drink like a delicious cold-brewed coffee." The dark color is exactly what I'd expect from a coffee stout, and I'll certainly say that they NAILED the silky smooth part, as this beer drinks with one of the smoothest mouthfeels I can remember. The coffee is definitely strong on the aroma, as well as hints of dark chocolate from the roasted malts. The taste is more coffee, hints of vanilla, and even more slightly bitter roasted flavor, like a combination of roasted malts and bitter dark chocolate. The milk sweetness gets lost in the other flavors but no doubt contributes mightily to the smooth mouthfeel which creates a beer that disappears from my glass far easier than the 7.2% abv should. Before I could even finish my thoughts I was done with 12 ounces and left with a pleasant coffee & chocolate aftertaste, which just made me want to grab the next bottle! 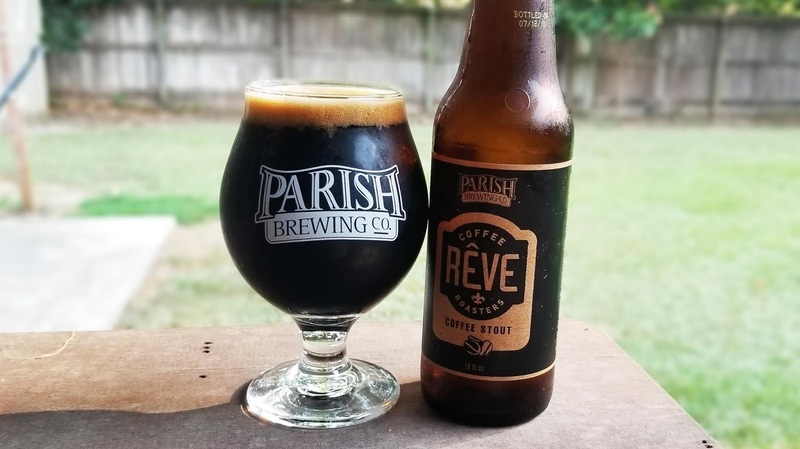 You might not think to reach for a dark beer in the middle of Summer, but don't pass up some of this Rêve Coffee Stout if you see it around town. Cheers! SB Beer #6. 10/19/18. Last experience with this was fire. Straight alcoholic cold brew. Some bitter hints but still great. Warms nicely. A great coffee stout. Rich, roasty coffee. Creamy body. Why are there so many different unique beers for this? Less good than on draft, but still yum.